Over the course of the last eight months I've become engrossed in the world of Fantasy Flight Games' Lord of the Rings LCG, despite the fact that it was released all the way back in 2011. For those of you who aren't familiar with the concept "LCG" stands for "Living Card Game," which is basically a fancy way to say "there's no blind boxes." This adaptation is built upon the foundation of co-op, and each pack is a fixed list of cards of the player and encounter (enemy) variety. You can play either solo or with a group with your own custom built deck and take on Sauron who's represented by a stack of said encounter cards that interact with one another in very unique ways. Over the past seven years it's become a flagship product of the LCG line, and now Fantasy Flight Interactive feels that it's finally ready to unleash a digital version on the world. It's in early access and needs work, but it does manage to capture the essence of the physical game. 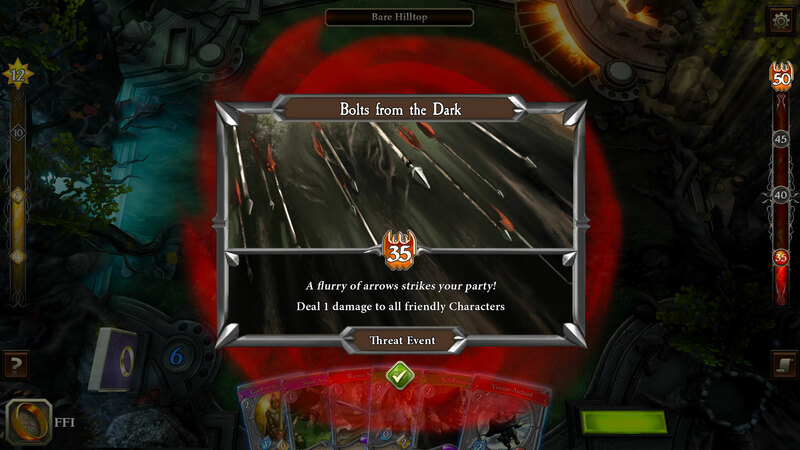 As soon as it was unveiled its art style and "bubble" icons drew many comparisons to a certain card game from Blizzard, but in practice it couldn't be more different. Think of it like an entirely adventure-based co-op Hearthstone with questing elements instead of straight combat and you're in the same ballpark. Commanding three heroes instead of one, all of which dictate which cards you're allowed to use (spheres), also makes for a distinctly different feel. Just like the real life version of the LCG, your job is to essentially defeat Sauron's forces from mission to mission. But here instead of drawing cards and following directions via a neutral "Sauron deck," you're facing off against an AI. You and Sauron will take turns either attacking, defending, or playing cards until both of you pass, then a new round begins. It's that simple. Well, kinda. The above picture, which I took from the tutorial, perfectly explains what's happening if you were to look at any given board state. Heroes are balanced by threat values, which are pragmatic (better heroes cost more threat) and thematic (more prominent characters draw the ire of Sauron). Most cards have attack values, willpower (called "questing" in the LCG), health, a sphere (used to build decks), and a self-explained ability (like Arwen's healing at the start of each turn). The general flow is unique as are many smaller nuances like bonus events that deal two damage to a random character after Sauron reaches a certain threat limit, and so on. Enemies generally need to be defeated but you can also make progress by way of questing, or, "attacking" objectives that pop up. Some objectives will let you travel to the next phase of a quest and exit that location altogether, and some will grant bonuses like extra allies (by freeing them from a web or something similar). This is where deckbuilding comes in, as you'll need to balance both combat and questing. Gimli might absolutely rock at the former but Arwen for example excels at the latter. Or you might employ a different hero that's strikes more of a balance like Eowyn. It gets even trickier when you add in keywords, most of which differ from the LCG and from digital card games in general. No cross-damage is dealt by bumping (read: attacking) unless they have the "guard" keyword on (a form of sentinel from the card game), and ranged can bypass guard requirements. That sort of thing. Understanding how each and every keyword interacts is, well, key, and you can remind yourself what's what with a quick mouse hover over card text. Speaking of a learning curve, the tutorial is a little long and a little dry (which is allegedly subject to change), but it really does a great job of explaining card interactions while leaving room for experimentation. 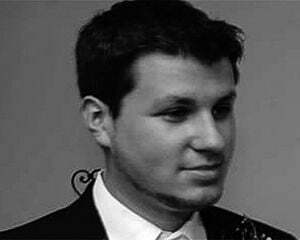 Again, deckbuilding is where the long term legs will come from. This digital adaptation is extremely difficult, even on easy. Health is carried over from step to step within a quest, and without some form of hard mitigation or healing (or smart play) your heroes are eventually going to die. Quests consist of multiple phases, and enemies with the "pursuit" keyword follow you into the next phase if you don't take care of them. One thing I learned quickly is that you can't rush things in this edition. Given that events happen at certain threat levels if you don't properly equip your characters or set up your board state, rushing into bosses will completely gut you. 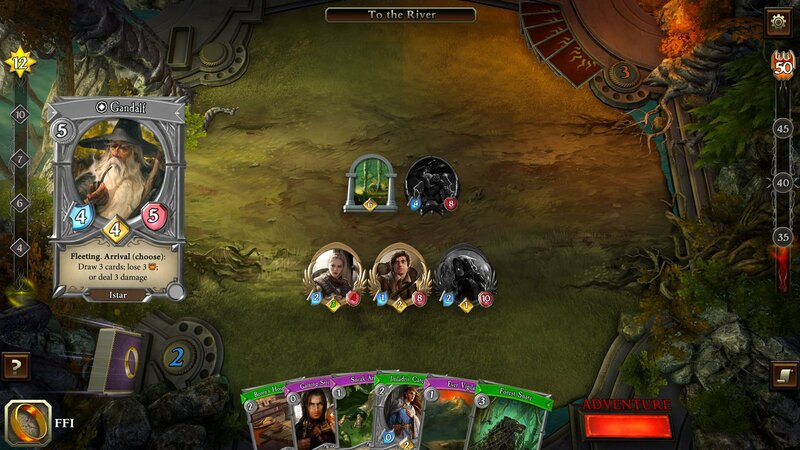 The problem was I was playing The Lord of the Rings Living Card Game on PC like Hearthstone, but really I should have been playing it more like the actual tabletop LCG. I don't know if people are going to get on board with this strategic long game concept, but as someone who already adores the physical edition I'm game. All it means is hours upon hours of theorycrafting and deckbuilding to get it right, which is exactly the kind of experience I'm looking for (for everyone else, I'm sure netdecks will exist soon enough that you can just use). All of this is backed by a fantastic score and full voice acting (that you can turn off if you wish), lovely card art (most of which is drawn from the LCG) and decent voice acting coupled with full quest narration. FFG is noteworthy for their adherence to Tolkien's vision, and that shows even in the pronunciations (Gloin is "Glow-in," the accepted Tolkien scholar form). The few qualms I have with the current state of the game mostly lie in the semi-confusing monetization strategy (which has been improved from its initial announcement) and the lack of options (a windowed fullscreen tickbox would be appreciated). Right now cards cost various forms of valor points, which are earned at a rather sluggish pace (if you buy the top tier Mithril bundle you can basically get every card). It also uses a randomized "Palantir" system to grant you cards you don't own, which thankfully can't be purchased outright to avoid gambling comparisons, but still feels out of place. I understand the need to provide some sort of long term support system for the game but I really would prefer the full LCG model to be employed here as it could reshape the way we look at blind packs entirely in the card game market. It's kind of there as buying defined hero packs and quests outright is great, but I'd like to see those packs to be expanded entirely -- bundle the quests, heroes, and more player cards together. FFG is already doing this physically, why not digitally? Asmodee is also super keen on their proprietary account system, and to gain access to the core set you'll need to register with them. This is now par for the course for card-based ecosystems like Hearthstone (a Blizzard account) or Elder Scrolls Legends (Bethesda account), but it's something to be aware of. 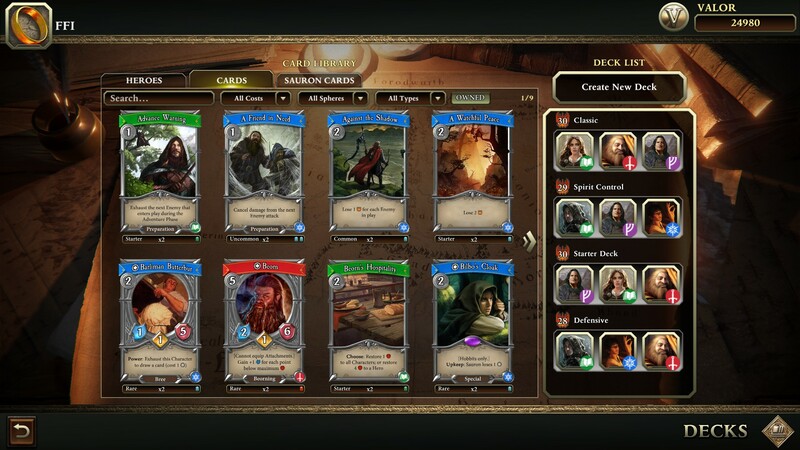 The Lord of the Rings Living Card Game is crafted by a company that loves Tolkien, and understands both the lore and how to craft a unique world around the source material. If you're at all curious about the prospect of a single player card game it's worth a shot, just note that Early Access is currently in effect; you'll have to buy into by way of several pricing tiers. More enhancements like co-op, additional quests (there's five right now in Early Access, each with multiple stages), and more heroes are also in the pipeline but not active right now.